AMDA alumnus JASON WISE, mentored by nine-time Tony Award-winning legend Tommy Tune, has established himself as one of New York's most exciting young director/choreographers. He began his career as a performer in the national tours of Disney’s Beauty and the Beast and Cats. 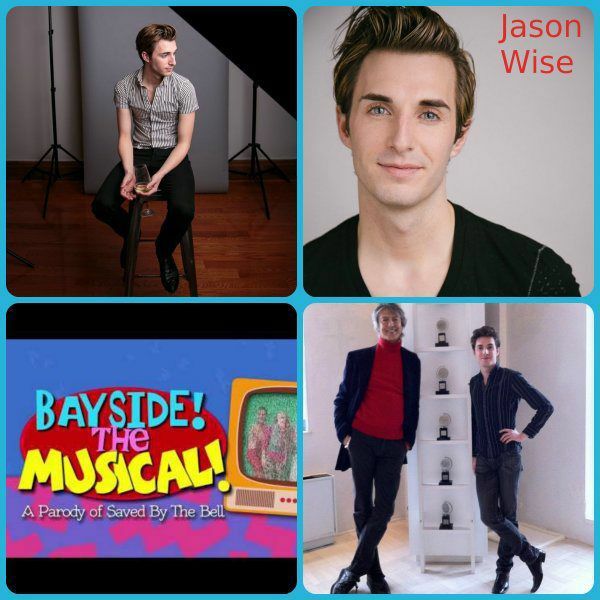 But today, with the assistance of Tommy Tune and two-time Tony Award winner Jerry Mitchell, Jason has transitioned into directing and choreographing. His recent credits include the Fiddler at 50 (the 50th anniversary concert of Fiddler on the Roof), 4 Girls 4 with Maureen McGovern and Donna McKechnie, the Off-Broadway production of Bayside! The Saved By The Bell Musical, Michael John LaChiusa's See What I Wanna See at The Producers Club, and the original East Village production and Midtown Off-Broadway transfer of Showgirls: The Musical!. As many will attest, making the transition from performer to director or choreographer can be very challenging. Jason offered some terrific insights when we caught up with him recently to hear more about his evolving life in the performing arts. AMDA: Tell us about your experience after graduating AMDA. You toured with CATS, what was life on a national tour like? JW: Life on a national tour was… a lot of vanilla lattes. My family didn't have very much money growing up so I hadn't traveled very much — it gave me a chance to see the world and make a living while doing it. With that being said, it wasn't all sightseeing and fancy dinners. You can never "stop home real quick", so you have to figure out how to survive. I think one of the things I'm the most proud of is being able to tell you where to buy deodorant, toothpaste and groceries in some of the top vacation destinations in the world. What did you do after the tour? After the tour I had to take it easy for a moment (I toured with CATS for 2 years on a tumbling track; the traveling, dancing and tumbling cocktail eventually got to my body) which is when I started choreographing. It was a way to stay busy, but without tearing (what was left) of my body up. As a kid, I grew up in my mother's dance studio so very early on I was exposed to the business side of things (why which girl got to stand in the front, the mechanics of "building" a number, etc.) and had always enjoyed choreographing. The only thing was, I wasn't sure how to break out onto the New York scene. I picked five Broadway director/choreographers I looked up to and wrote them letters, asking if they would meet with me so I could pick their brain. You know — figure out how they did it. When did you decide you wanted to pursue choreographing over performing? Shortly after I wrote the letters, I heard back from two Tony Award Winners, Jerry Mitchell and Tommy Tune. Both agreed to meet with me. Jerry advised me to put my work on film so I had something to show for myself. I saved money, rented a studio and called eight Broadway dancer friends. I filmed the number, sent it back to Jerry and he gave me a few critiques. I started applying his advice, did a few more of these videos, and soon after I was getting phone calls to choreograph benefit concerts and small projects around the city. While all of this was starting to take off, I was still auditioning as a dancer. Sometimes it was bizarre, because I was auditioning next to people on Wednesday I had cut from an audition I was running on Monday. They kind of looked at me like "What are you doing here?" During this time, I got a job on the national tour of Disney's Beauty and The Beast and left everything to go on the road again. While in tech, I had an epiphany. I had worked so hard for 2 years to "become" a choreographer, and when it was finally starting to happen, I left? I let myself think about it for a few days. I didn't have a job offer to go back to, and I wasn't sure what I was going to do for money, but I made the decision (while onstage dressed as a carpet) to leave. I actually put my notice in at 3pm on opening night. I apologized for not having this realization until after they had rehearsed me, flown me out, and hemmed all my costumes, but they were very understanding and let me go with no hard feelings. Contractually, I was obligated to stay for six weeks, but they found a replacement quickly and eight days later I was headed back to New York as a choreographer. Tell us about some key moments that helped you kick your choreography career up a notch. Absolutely writing the letters, because that gave me access to gifts that keep on giving. Jerry gave me the advice to not wait for anybody to hire me to start doing it — to just do it, and someone will take notice (and they did!). Then there's Tommy, who has become a show business godfather to me. Aside from picking his brain in person, Tommy has been there for me to call when I'm in rehearsals and having a problem and he (always) has a solution, even if it's something I don't want to hear. He is honest and truthful with me and thanks to that I think I've grown not only as a creative but also as a person, and I think this has reflected itself in quality of my work. Another key moment was making the decision to either be a dancer or be a choreographer. Of course it's possible to do both, but once I focused myself and zeroed in, life really started to change. I dropped my performing agent (which I had worked so hard for) to sign with a creative team agent. It was another risk in a series of scary decisions, but I think getting rid of the gray area also helped others look at me solely as a creative and solidified my reputation as a choreographer. There are things I miss about performing, but there are other thrills that have been equally as rewarding and exciting. What are you doing now? Tell us about all of the recent developments. I am represented right now by an Off-Broadway show (Bayside: The Saved By The Bell Musical), which landed on the coveted New York Times Critics Pick list and has been running for almost a year. We've had some of the original stars of the series join the cast (Dennis Haskins and Dustin Diamond) which has been very cool. I also just associate choreographed a new national tour, 4 GIRLS 4 starring Andrea McArdle, Faith Prince, Donna McKechnie and Maureen McGovern. We had the world premiere in Boca Raton and it was a great success. Two weeks ago, I choreographed the 50th Anniversary Concert of Fiddler On The Roof and Sheldon Harnick gave me a compliment I will remember forever. I also was hired to be the resident choreographer at Ellen's Stardust Diner in Midtown. Reality show cameras have been capturing my rehearsals which has been a blast. And in a freak happenstance (that can only happen in New York) I met an agent from London who signed me for representation in the West End market and I'll be heading over there in June for my first string of meetings! What advice do you have for young dancers and choreographers just graduating? Believe that you're the best. Write letters. Talk to anyone who will listen. Drink Coffee. Read about the Law of Attraction. See every show you can so you know what's going on. Then go home and read every word in the Playbill including the restaurant listings. Meditate. Be yourself. Save your money (even when you're making it, live as if you're not). Take risks. Don't get jealous. Paint. Know your history. Have somewhat of a life outside of show business. Make clear choices. Remember names. Call your parents. Walk Manhattan without having a destination. Don't change your phone number. Keep small things around your apartment to remind you of a time when you dreamed of living in New York and being a part of Broadway because there's going to be rough days and you have to get through them. And never take your time here for granted — every day you wake up in New York is a gift. Even when the city chews you up and spits you out, remember there's a kid in Kansas who could give anything to even get one week here. Everyone who's anyone is within 13 miles of you. If your dream seems far away or the odds of a miracle happening seem slim to none, remember (if anywhere) it can happen in New York — in 24 hours or less.